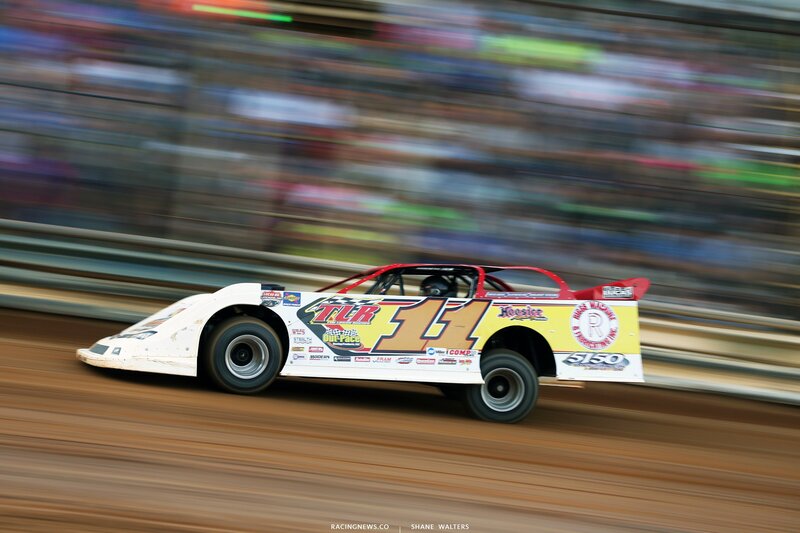 Tyler County Speedway hosts a big one tonight. 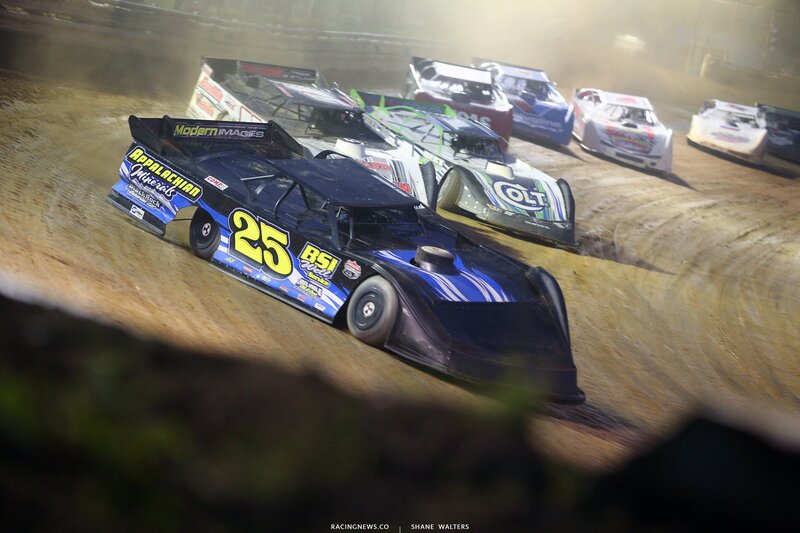 The Lucas Oil Late Model Dirt Series rolls into Middlebourne, West Virginia. 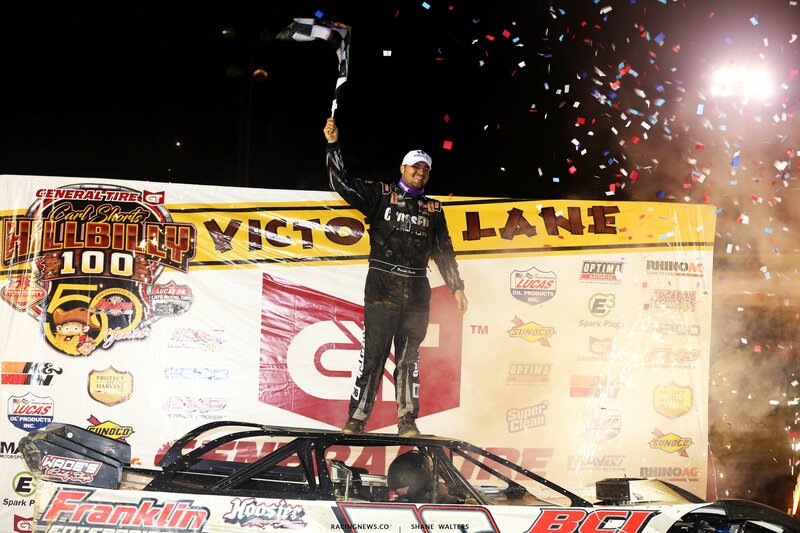 The race winner will pocket a check for $50,000 following the conclusion of the crown jewel dirt late model event. View full 2018 Hillbilly 100 results below. Jared Hawkins is quickest in group A with a 12.507. He topped Bloomquist by 0.020 seconds. Tyler Erb was quickest in group B. He was 0.04 quicker than Mike Benedum. Hawkins takes the pole in the 2018 Hillbilly 100. From here, group A will set heats one and two as well as the first B Main. Group B will set heats three and four and the second B Main. The first heat race is the race for the pole in the main event. Jared Hawkins and Greg Oakes set the front row for heat race number one. The winner of this race will start on the pole for the main event. Green, Hawkins leads on the bottom into turn 2. Several cars stake up off turn two. Oakes is around in turn 4. I think he and Satterlee made contact. The caution is out. Oakes to the tail. Green, Hawkins leads. O’Neal to 2nd. Bledsoe and Mayle are tangled in turn 1, caution. Green, Satterlee to 2nd. He’s putting pressure on the back bumper of the leader. Lap 7, Hawkins has opened the gap back up. Hawkins wins the first heat race of the night. 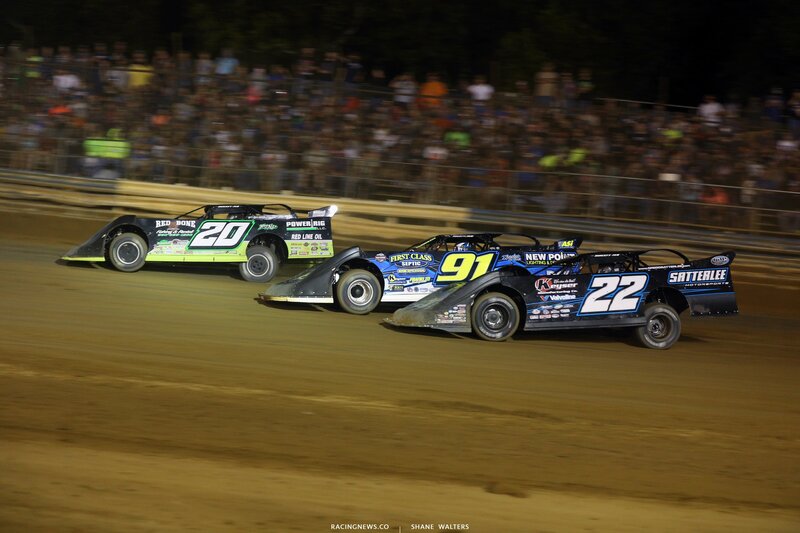 Scott Bloomquist and Bobby Pierce trail the pace truck ahead of heat race number two. Green, Bloomquist leads into turn 1. Pierce runs wide, he loses several spots. Chris Garnes is up to 2nd. Bloomquist leads by 5 car lengths. Pierce has fallen to 4th. The field spreads out quickly. 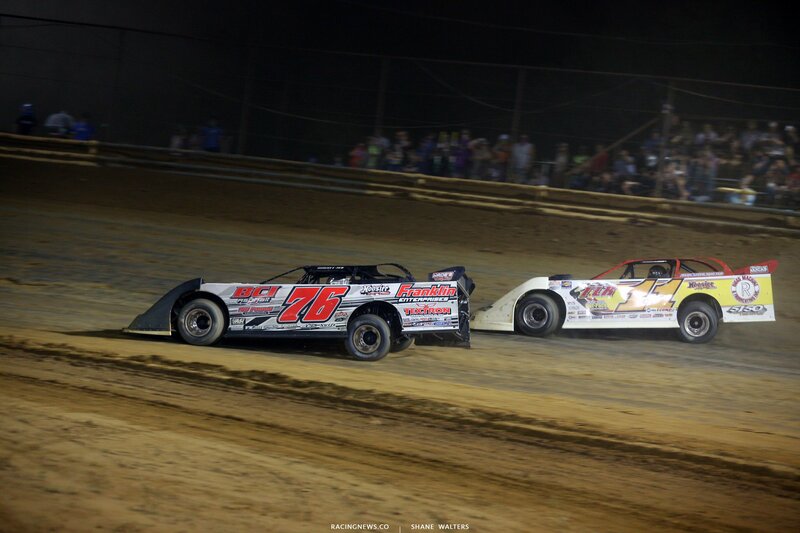 Garnes is closing the gap as Bloomquist works lapped traffic. He’s going to run out of time. Scott Bloomquist wins heat race number two! Tyler Erb and Kyle Bronson will lead them to the starting line in heat race number three. Green, Tyler Erb slides him in turn one. Bronson holds 2nd. Tyler Erb begins to pull away. There’s a train of cars behind Bronson as they fight for 2nd. Davenport is exploring the high side. He’s the only car in the top five doing so. He drops back to the bottom. Back to the top the next lap, he’s exploring. Owens heads to the top. He works by Bronson to take 2nd. Slow car on track. The caution is back out. Green, Erb leads. Owen hits the cushion he has a run off turn two but he’s going to run out of time. Tyler Erb wins heat three! Mike Benedum and Bronson Overton set row one for the final heat of the night. Green, Benedum leads on the bottom. Overton hits the top and comes out in 2nd. 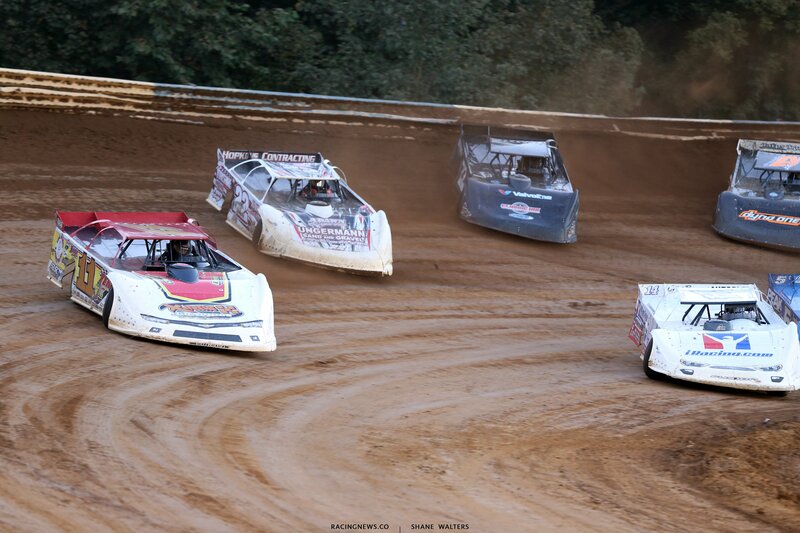 Pearson, Richards, Moran and another run 4 wide into turn 3. They finally ran out of room on this narrow track. Moran is around into turn 1. The caution is out. Green, Benedum leads Overton. He’s on his back bumper but can’t find a way by. Lap 12, Benedum opens a gap of a single car length. 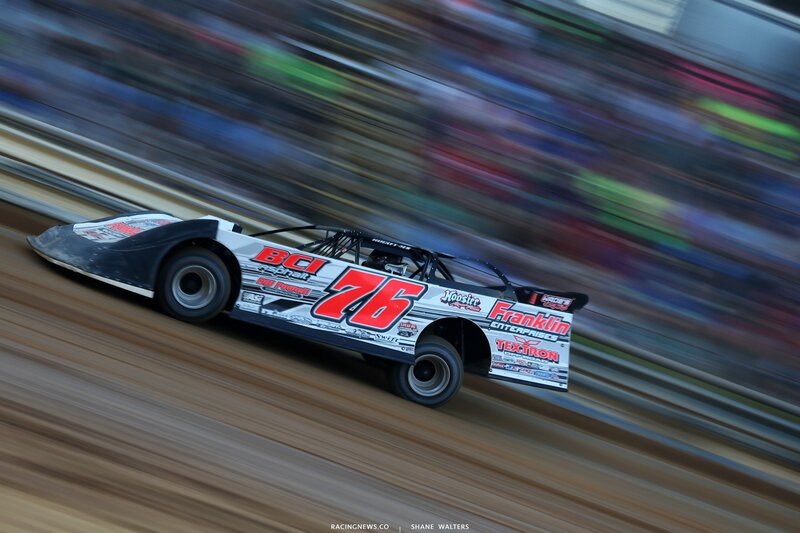 Benedum wins the final heat race of the night at Tyler County! Jared Hawkins and Tyler Erb will set the front row for tonight’s 100 lap main event. The winner of the feature winner will hit the road with a $50,000 check. That’s a special 50th anniversary purse. 4 wide salute, fireworks and they’re ready for the starting line. Green flag, Hawkins noses ahead into turn 1. He’s nearly clear of Erb off turn two. Hawkins completes the pass into turn 3. Smoke from the fireworks is falling on turns 1 and two. They’re still green. Haskins is in lap traffic early. He leads Tyler Erb by 5 car lengths with two lap cars between them. Owens gets by Bloomquist to take over 3rd. He’s running down Tyler Erb. Bloomquist is back on the rear bumper of Owens. Kyle Thomas is slow on track. The caution is out. Green, Hawkins leads. Owens hits the top in turn one. He runs side by side from 2nd with Erb. 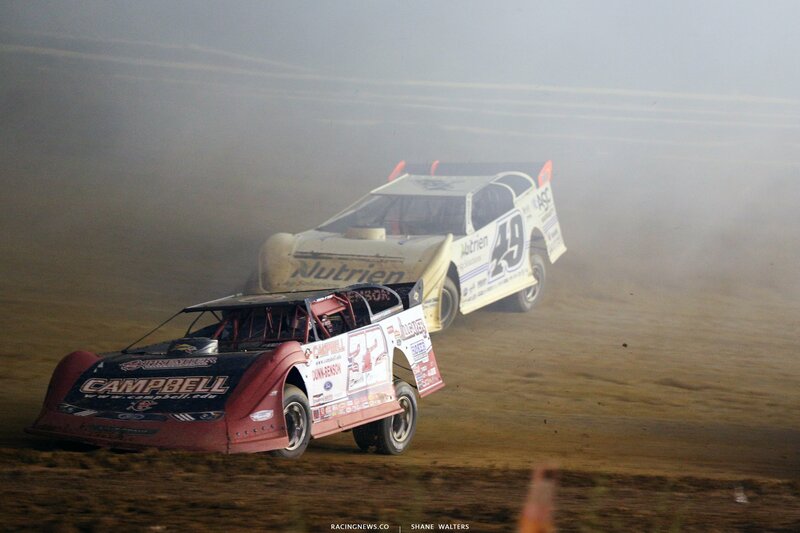 Satterlee gets a run on both of them, he looks to the inside off turn two. They run three wide for 2nd down the back stretch. Erb noses ahead on the bottom into turn 3. Owens is hard on the gas around the top. Owens takes the position off turn 4. Owens is running down Hawkins. He’s closed to within two car lengths. Tyler Carpenter is slow on the track. The caution is back out. Green, Hawkins leads. Owens is clear for 2nd off turn two. Owens is looking for the lead! He takes it the the high side in turn 1. Owens has a run off turn two. Hawkins slides to the wall and takes the lane away on exit. Owens crosses under him off turn two. He looks low into turn three. Hawkins shuts the door. Owens goes back to the top. He’s aggressively looking for a way back. Owens backs off. He’s fallen back two car lengths. It must have been to cool his tires. Owens is back on the bumper of Hawkins! He has another run off turn two. 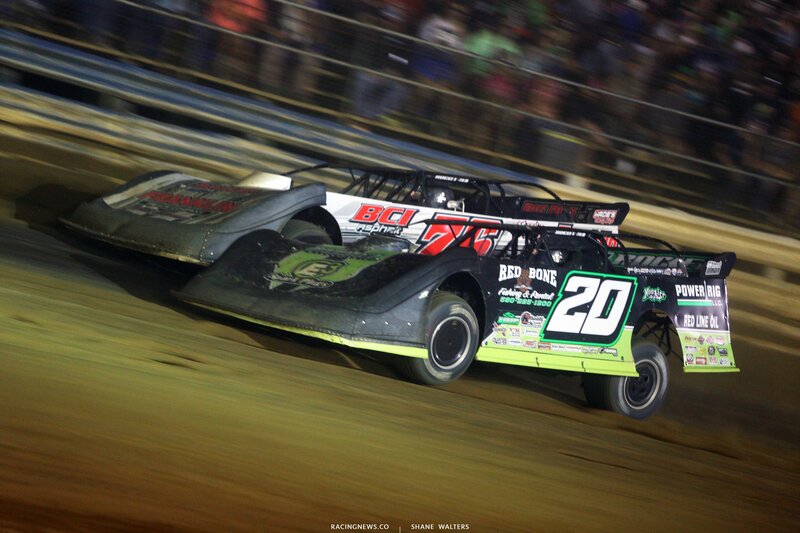 Owens drives it hard to the bottom in turn three. He noses ahead on entry but at the sacrifice of the corner exit speed. Hawkins pinches him and holds the lead. The caution is out. Bloomquist heads to the pit area. Green, Hawkins leads Owens. Overton is coming in a hurry. He’s the fastest car on the track. Overton is banging off the cushion and looking for a lane around Owens. Overton fills the gap between Owens and the wall off turn two. 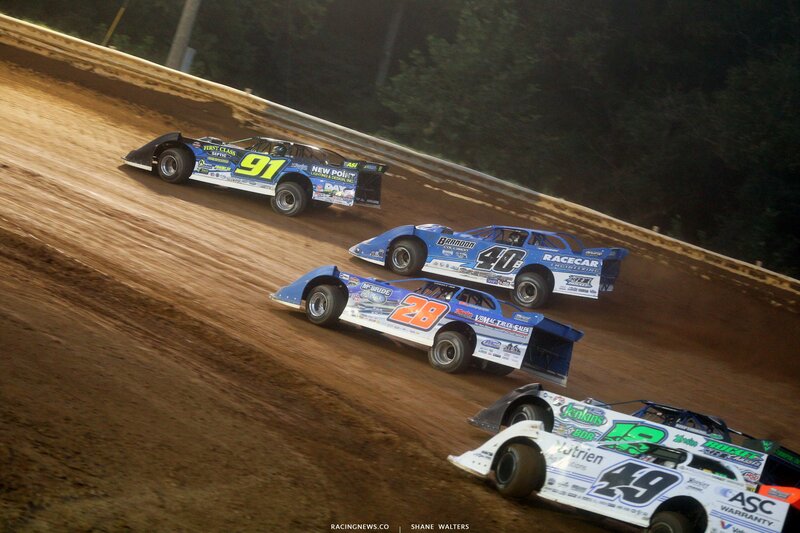 I don’t think Owens expected him to fill that gap, they bang fenders down the back stretch. Overton is clear for 2nd. Overton is running down the leader. Overton hits the cushion into turn three. He comes off turn four with a bunch of momentum. Hawkins shuts the door and slides to the wall off turn four. Overton crosses him and looks low into turn one. They run even off turn two. Overton drives it deep to the bottom in turn three. He slides him. Overton clears his front bumper by inches. He drives up the hill, catches the cushion and takes the lead at the flag stand. Green, Overton is gone. Pearson is slow, caution. Green, another caution. Green, Overton checks out. He leads Hawkins by the length of the straight away. Sheppard is around in turn four. Pearson caught a piece of that as well. The caution is back out. Green, Overton checks out once more. Hawkins holds 2nd as Zeigler takes over 3rd. The caution is back out. Green, Overton leads. Hawkins holds 2nd. 5 to go, Overton leads Hawkins by six car lengths. 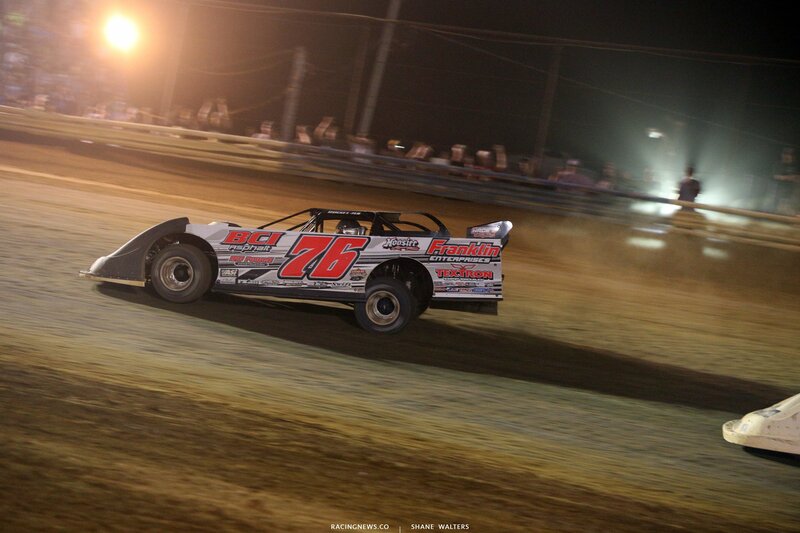 Brandon Overton takes the win at Tyler County Speedway! 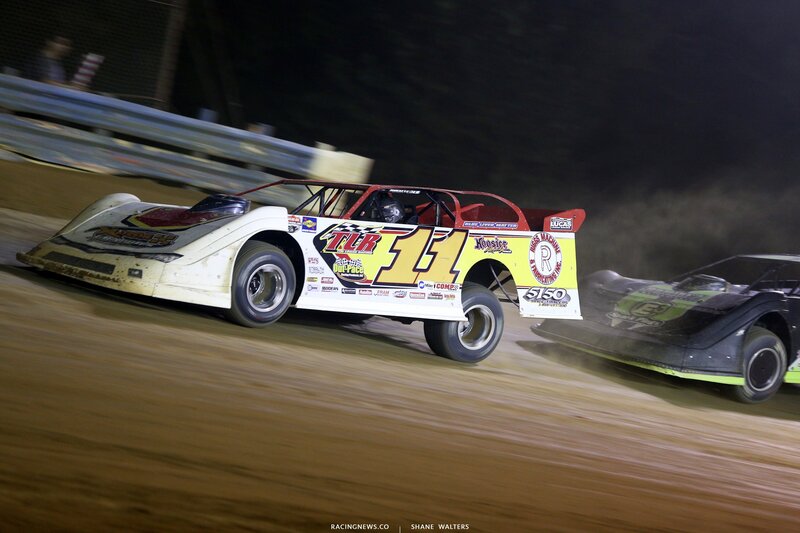 View full 2018 Tyler County Speedway results below. From here, the tour has a week off. On September 13-15, the will return to Knoxville Raceway. 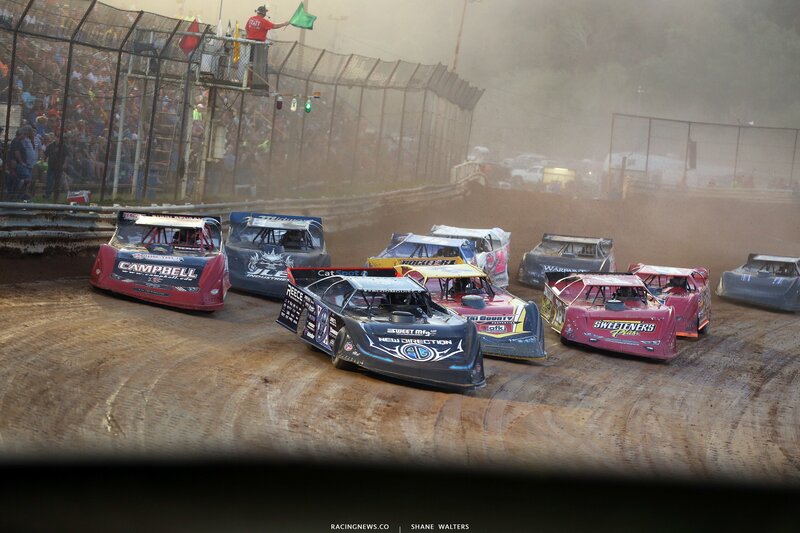 The Knoxville, Iowa dirt track will host the Lucas Oil Late Model Nationals. Dirty Girl Racewear Farthest Traveler: Ricky Thornton Jr.